Self-Care Challenge Month 3: Physical Activity & Exercise – Glass Half Full with Leslie Krongold, Ed.D. If you’ve joined me on this Self-Care Challenge since the first month, thank you! I hope you’re progressing well, learning a lot, and achieving a few goals you may have set for yourself. If you’re new to the Challenge, feel free to join us now. Briefly, here’s what you’ve missed. The first month we spent identifying symptoms and/or health challenges we’d like to work on. I introduced you to six categories of Self-Care practices. We became familiar with the Health Storylines app. During Month 2 we focused on Diet & Nutrition. In the Glass Half Full Group on Facebook we shared information related to Diet & Nutrition. You’re welcome to join this group at any time to deepen your exploration of self-care practices. The challenge this month is all about moving your body, and it’s not just called Exercise. That’s a scary word for some people. Even scarier for me is the term…physical education. That brings back miserable memories for me throughout elementary, middle, and high school. The competition, humiliation, and mandatory one piece gym suits never fostered a love of exercise. But I did enjoy other activities involving movement. I loved dancing in high school and college and never thought about it as exercise. Recently I purchased a Fitbit Charge 2 device which I wear daily. The data feeds into the Health Storylines app. The wrist device tracks my steps which motivates me to walk more. There are days when I don’t officially exercise but do house and garden chores and I can hit 10,000 steps. That’s movement and it certainly counts. But my feet and legs don’t work as well as they used to. I have drop foot and often am too fatigued to walk. That’s when classes such as gentle yoga and chair fitness classes are a big help. 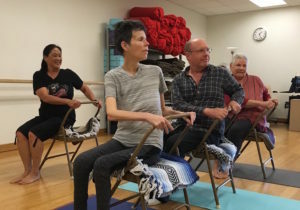 I’ve attended a variety of chair yoga classes and tomorrow I’m going to a Seated Tai Chi class. 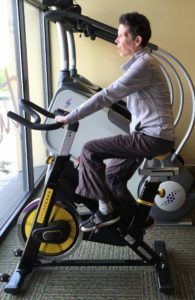 Adaptive exercise classes are wonderful. But maybe you don’t have these adaptive exercise course offerings where you live? Or perhaps you just don’t want to leave your home? That’s when the DVD player becomes your coach. I am a big fan of gentle exercise DVDs especially when it’s hot outside and I don’t feel like driving to the gym. Here are some of my favorites: Yoga for the Rest of Us, Chair Dancing through the Decades, Simple Qigong, Sitting Fit Anytime, and Tai Cheng. Join us in the Facebook group for a month-long focus on moving our bodies. I’ll share some evidence-based research studies as well as ideas for boosting your daily physical activity.